Urban Veggie Garden Blog: Late Crop Round Up! still quite a bit to harvest, hope the weather holds out! Can't wait to see the post on cucumber seed saving. Those squash look great too. Those are some nice looking squash, Dan. I've never seen any of them before. I'll really be interested in your seed saving for cucumbers. Everything looks really good! 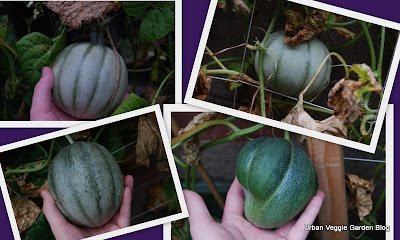 A few of my petit gris melons were odd shaped, too. That red squash looks like it ought to be tasty. So does roast squirrel go good with baked squash? Just wondering! I know they were not productive for you but the red kuri squash is really interesting looking. That purple pepper is a bit good! Wow on your broccoli! I've never seen it that big in a home garden. Looks great! Inquiring mind, here, very happy you reminded us of the broccoli dates. I definitely started mine a little late. Still lots to come, Dan ! That's wonderful. The purple peppers are stunners, so are the squashes. That's a handsome clutch of Purple Calabash. From what I've seen on Kathy's blog, they're just gorgeous-looking tomatoes. Blight resistant, too ? I'd say that's a winning combo ! Will try them for sure next year. Everything is looking good! I'm sad though because soon it's going to getting COLD. Don't you just hate those furrie that eat your harvests. I have chipmunks that are feasting on my tomatoes. The delicata squash are so sweet. I bought them last year from the farmers' market. I love them roasted with a bit of butter and maple sugar in the well. Yum. Your broccoli head looks so pretty. It is just perfect. I hope your Sungolds ripen. I really like them; hope you do too. Lots still out there. I would just fry the peppers with onions and garlic for pasta, but what do I know? Slow frying makes them so sweet. Your broccoli head looks great. I knew you were concerned about planting late but I think your timing is good for a fall harvest and side shoots. We used to grow hot peppers, a different variety. You may be able to hang them and let them dry out, and add a pepper to a stir fry from time to time for a little kick.